Balconies in the Gothic Quarter of Barcelona, Spain, earlier this week. 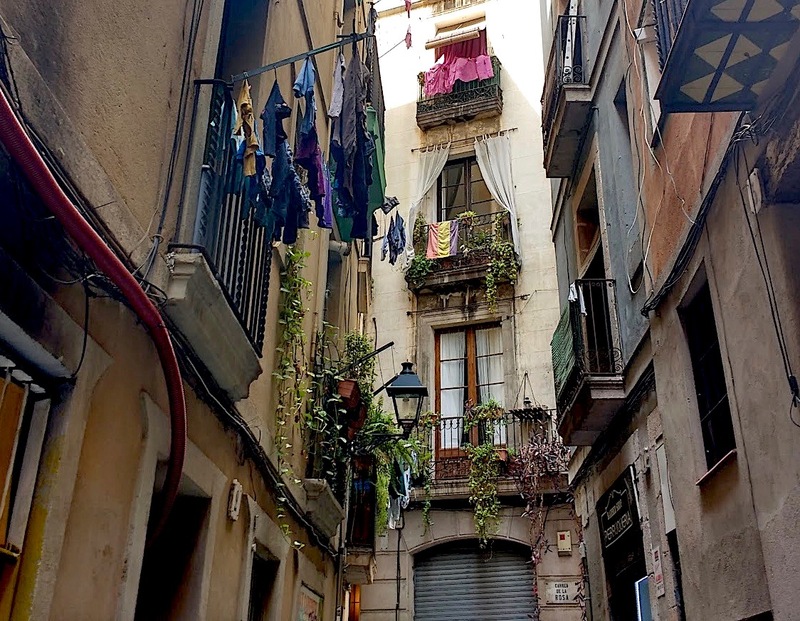 The Quarter is the oldest part of Barcelona, with foundations in the Roman and medieval periods. However, many of its current structures were built or significantly reconstructed in late 19th and early 20th centuries. Its streets, however, remain narrow and winding, sometimes opening up to small squares. We spent five days in the city, after almost two weeks in Toulouse, France. Toulouse is all about the 13th to 15th centuries, while Barcelona glories in the late 19th and the 20th, so it was an interesting shift after a three hour train ride. As tourists, our energy levels were winding down, however. We rode the hop-on hop-off bus (without hopping off) and toured Gaudi’s Basilica Sagrada Familia (reserve tickets in advance; it’s remarkable) and Casa Amatller (they give you good hot chocolate and bread at the end), and watched the red rose and book selling of Sant Jordi’s Day on April 23. But mainly we just walked around and soaked up the perfect spring weather. We stayed at Hotel AC Irla (a Marriott affiliate) in an upscale section of the Eixample district with easy public bus connection to and from (the V11 and V13, respectively) the waterfront and the Gothic Quarter (buy a T10 ticket from a magazine/newspaper stand; it will give you 10 rides* for about one euro each). My only food tip: if you tour Sagrada Familia on a Wednesday to Sunday, book the 11:30 a.m. time slot and then have lunch at Arepamundi, a small Venezuelan arepa place a couple blocks south of the basilica. Order the small size arepas so you can enjoy more than one filling (get the Venezulana and the one with shredded meat, beans, fresh cheese, and fried bananas). Barcelona brought back some memories of living in Caracas in the 80s. *Validate it each time you enter a bus, subway, or tram. If two people are using the same card, punch it twice each time. If transferring within an hour and a half from subway to bus (or bus to bus), punch it, but it won’t count as a new trip. 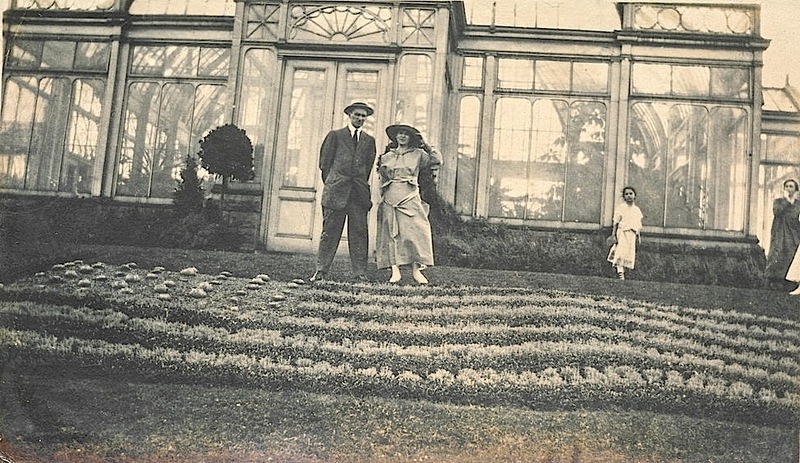 “Couple standing in front of a greenhouse,” ca. 1920, location and photographer unknown, via simpleinsomnia on flickr (under CC license).